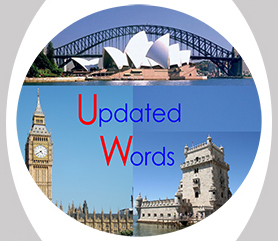 Since 2008 Updated Words have been a Team of 2 passionate translators who share their love of languages and writing. It has been a great experience for both members and they certainly love the work and the relationship they have developed with clients and the visitors of their social media pages. In the 2015 the team considered expanding the Team, and even though they were not actively searching for new members, they were aware of that idea should the opportunity present itself. That happened in February 2016. A translator who was Cátia Cassiano's colleague of the Translation Course at the British Council showed interest in be a part of the Team. After discussion her entry was approved. So today we are very proud to announce Mrs. Margarida Sousa, the brand new member of the Updated Words family. Margarida is a professional translator who has more than 20 years experience in this industry. In her words she "prefers the technical areas" and that's why she specialises in administration and legal translation. Most of the times she translates from Portuguese to English but she is also qualified to translate from English to Portuguese. She loves a good challenge and being involved in innovative projects. Please feel free to visit our website and see her profile page, so you can find more about her and her services. Feel free to contact her should you have any queries.